PINK’S SQUARE has many choices to attract diners, as can be seen in this graphic. The corner of Melrose and La Brea avenues may have been the home of one lonely pushcart in 1939, but by 2018 it has become home to at least 12 other cafés and restaurants, making it a go-to corner for people who can’t quite decide what to have for dinner or where to get their breakfast or coffee. Read on to learn about some of the other eateries in and around the newly designated Pink’s Square. This story reports on establishments on La Brea and Melrose avenues, between Clinton Street and Waring Avenue and between Sycamore Avenue and Detroit Street. 1. What better place to begin than Pink’s Hot Dogs, 709 N. La Brea Ave., where you can order everything from chili or kraut dogs to plain or vegan dogs? You can even have a hamburger. 2. Going south along La Brea to the northwest corner, Chipotle Mexican Grill, 7101 Melrose Ave., serves design-your-own burritos and taco bowls. 3. Cross La Brea and you will find Tsuri Sushi and Sake Bar, 7015 Melrose Ave., offering sushi from premium rolls to lunch specials and bento boxes. 4. Diners can try the naan bread and chicken tikka masala at Anarkali Indian Restaurant, 7013 Melrose Ave. Forty years younger than Pink’s, Anarkali is celebrating 38 years! 5. One door east is Hot Wings Café, 7011 Melrose Ave., serving chicken wings, burgers and more. 6. Cross Melrose and you’ll see Standing’s Butchery, 7016 Melrose Ave., for those who want to source their food for a meal at home. 7. Don’t forget the coffee and a taste of the Pacific Northwest at Coffee for Sasquatch, 7020 Melrose Ave., which has a mod take on the espresso bar. 8. Walk around the corner, south on La Brea, and take cooking into your own hands at Eatz, 612 N. La Brea Ave., which offers “extremely” personal cooking classes in a dinner-party environment. 9. 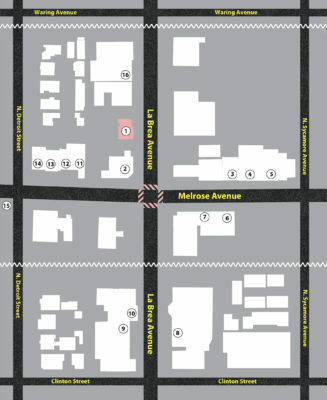 Cross La Brea, and find Bludso’s Bar & Que, 609 N. La Brea Ave., on the west side of the street. It has classic Texas barbecue and sides. Creative cocktails are on the menu. 10. Next door, going north, is Pizza Romana, 615 N. La Brea Ave. Pizzas are baked in a wood-fired oven, and gelato, beer and wine are also served. Walk north and back across Melrose again, and west of Chipotle are four dining places in a mini-mall. 11. If you have a craving for noodles and Japanese fare, try Tatsu Ramen at 7111 Melrose Ave.
12. If comfort food is what you want, check out the Italian subs and build-your-own sandwiches on homemade bread at All About the Bread, again at 7111 Melrose Ave.
13. Vegetarians and omnivores alike can feast on macrobiotic vegetarian dishes from burgers to sushi at M Café, which takes up 7617 and 7119 Melrose Ave.
14. Try gluten-free pizza, or order a nice thin crust at Lucifers Pizza, 7123 Melrose Ave.
15. Kitty-corner to Lucifer’s Pizza, just across Detroit Street and slightly out of the Pink’s Square boundary, and not open quite yet, will be Chef Christina Tosi’s Milk Bar Bakery, 7150 Melrose Ave. Originated in New York City, the popular bakery is known for its “naked” cakes. 16. And finally, if you feel like a little adventure, a little drinking and a little dancing after dinner, check out The Plaza, 739 N. La Brea Ave, just north of Pink’s. Called the “Best Drag Show” in 2007 by “Los Angeles Magazine,” this hole-in-the-wall cantina is a bit of a dive, but it’s a nice contrast, featuring sequin-gowned female impersonators lip-synching Latin music. Cash only.